I try to finish all the quilts I start. Really, I do. Even with the best of intentions, though, I have a growing pile of UFOs (UnFinished Objects). The thing about those UFOs is that they're really doing me no good at all. I can't gift them to anyone, or use them as decorations, or cuddle up under them with a book. This is true of so many things, isn't it? So many people set out to write books or lose weight or train for a marathon and never meet their goals. Those UFOs aren't doing anyone any good either. It's exciting to start something new. There's so much promise and so much potential in a new beginning, but it's the finishing that really matters. Jesus came to earth with a mission - to save mankind from their sins and restore our relationship with God. The start of that mission (Christmas) gets a lot of attention, which is understandable. Newborn babies and presents are fun and exciting, certainly more so than the torture and death that are the main elements of the Easter story. 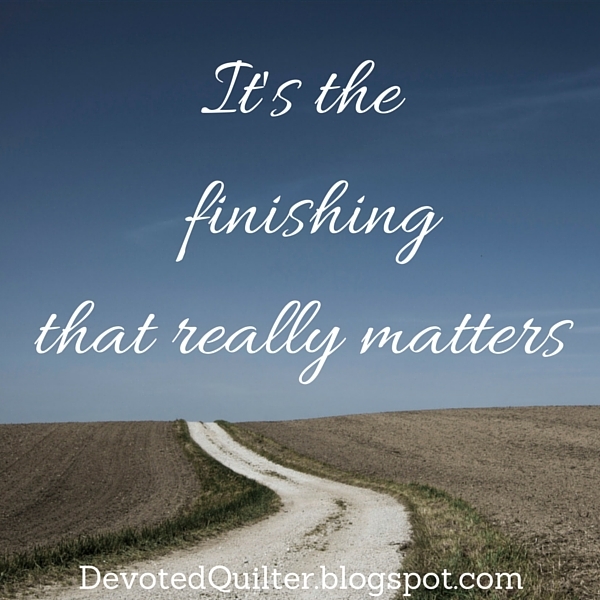 And yet, if it's the finishing that really matters, then Easter deserves the greater attention. I will be the first to admit that I don't really understand how Jesus could have been both fully man and fully God, but I believe there was always the possibility that Jesus wouldn't complete the mission. As I see it, there were two weak points, where Jesus' humanity could have caused Him to turn away from God's plan. First of all, He was fully man, which means He could have given in to the temptation to sin. You can read in Matthew 4:1-11 how Jesus was tempted by Satan at the start of His ministry, but I don't think those were the only attempts Satan made. He knew who Jesus was and I doubt he would have given up so easily. Those may have been the most blatant attempts he made, but I would imagine Satan tempted Jesus with common sins like anger and lust and idolatry just as often as he tempts us, maybe even more. In Hebrews we read, "For we do not have a high priest who is unable to empathize with our weaknesses, but we have one who has been tempted in every way, just as we are—yet he did not sin" (Hebrews 4:15). He was tempted in every way, just as we are, but Jesus never gave in! If He had, even if He had sinned only once, there would have been no perfect sacrifice to make atonement for all of us who are so far from perfect. He finished His 33 years of living on earth without giving in to the temptation to sin. Second, since He was fully man, He had a body just like ours. Undoubtedly He fell as a child and scraped His knees, or hit His thumb with a hammer while learning carpentry from Joseph. He knew what pain was. He also knew what was coming. In Luke 9:22 Jesus told His disciples, "The Son of Man must suffer many things and be rejected by the elders, the chief priests and the teachers of the law, and he must be killed and on the third day be raised to life." The disciples didn't understand, of course, but Jesus knew. Just think for a moment how you would feel if you knew that in a couple of days you would be handed over to corrupt authorities who would beat you, whip you and kill you. Think about the pain you would feel as that whip landed on your back. Wouldn't you run from that pain? Wouldn't you try to get as far away as you could, to hide in a place where they would never find you? I know I would. But Jesus didn't. In fact, "Jesus resolutely set out for Jerusalem" (v. 51). I like the word resolutely. It means He didn't head for Jerusalem lightly, but He also didn't go against His will. He knew what was coming, and He chose to go anyway. He went to Jerusalem on purpose. Not that He didn't check in with God to see if it was possible to avoid all that pain. He did ask, after all. Shortly before He was arrested, Jesus prayed, "My Father, if it is possible, may this cup be taken from me" (Matthew 26:39). Essentially, He was asking, 'Can we do this some other way?' Now, I don't know why it had to be done the way it was. I don't know why there had to be beating and excruciating pain. I understand that He had to die to pay the price for our sins, but I don't know why it couldn't have been a quick and painless death. But whatever the reason, it was not possible for that cup to be taken from Him and, in the end, Jesus chose to continue with the plan. The full verse reads, "My Father, if it is possible, may this cup be taken from me. Yet not as I will, but as you will” (v. 39). Through it all, He endured. Though the pain must have been intense, He never wavered in His dedication to God's plan. And when He cried out on the cross, "It is finished," (John 19:30), it was a cry of victory, a celebration of a mission completed. It was, and is, a finish worth celebrating!